If you need corn removal surgery in Beverly Hills, Los Angles, Inglewood, or other surrounding areas, you can count on expert podiatrist Dr. Ravaei for professional cosmetic foot surgery. Corns and calluses are among the most common problems that we treat at our practice. They can occur on any part of the foot and vary in symptoms from a mild callus under the foot, to a painful corn on top of the toes. Unsightly and painful, these foot problems worsen over time. Fortunately, you don’t have to suffer. Thanks to advances in corn removal surgery and our expertise, relief can soon be yours. At our office in Beverly Hills, permanent removal of corns is among the most popular procedures that we perform every year Patients appreciate knowing that Dr. Ravaei has personally carried out more than 7,000 surgical procedures. In fact, given the increasing demand for the services of Dr. Ravaei and his medical staff, we now offer multiple locations, for permanent removal of corns. In order to better understand the growing need for cosmetic foot surgery in Los Angeles, let’s take a moment to examine these common foot ailments. Pathologically, all corns are the same—the skin has thickened in response to pressure. 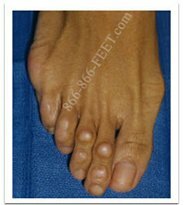 A callus generally refers to a more diffuse, or spread out, thickening of the skin while a corn thickens in a specific area. Both calluses and corns are more common on the toes, but calluses can also occur under the ball of the foot. One particularly unpleasant problem is that a corn can occur under, and be surrounded by, a callus. and biomechanical or gait abnormalities that impact the plantar, or bottom, of the foot. If left untreated, corns and calluses only become more painful. Cutting corns or calluses yourself (so-called “bathroom surgery”) is not without its dangers. Likewise, doing nothing—allowing the corn to continue forming in the warm, moist environment of enclosed shoes—can raise the risk of infection. This in turn can lead to serious complications for people with poor circulation, peripheral neuropathy, or diabetes. Remedies such as corn paint, cure, or plasters generally only treat the symptom and not what causes it. The chemicals in these products also pose a serious risk, particularly to people with poor circulation or diabetes. In our practice, we meet many patients for whom the use of "corn pads" has resulted in discoloration of the affected skin, uglier corns, or even acid burns. Ultimately, well-timed corn removal surgery is almost always the best option. Dr. Ravaei can diagnose your symptoms, run tests, and make a medically sound recommendation. He will also discuss with you what takes place during this safe procedure. This is a same-day procedure and most patients are able to walk on their feet shortly afterward. and avoiding undue pressure on the foot or toes. Such after-care is critical. After all, surgery can remove corns—but pressure can bring them back. Our objective is to ensure that your corn removal is truly permanent! For this reason, Dr. Ravaei makes a point of customizing the treatment plan to your personal needs. Talk to us today. From convenient locations to personalized care plans, our practice is here for you.